This past weekend marked our first weekend of solo travel, and to put it simply, it was an indescribable experience. Every single part of it felt like a dream, and I still can’t believe this is my life currently. I have to keep pinching myself and reminding myself that I’m here in Europe for the next 3 months. I’m not going to wake up one morning and find myself back in Chicago. Sometimes that’s been hard to comprehend because I really do miss my family and my friends back home. However, I’m lucky because I’m here in Rome with three of my best friends, one being my roommate and the other two studying at John Cabot whom I’ve known since high school. So far, everything has been incredible and I wouldn’t change a single thing. 1. Go to Downtown Sorrento: We stayed at a hostel called Seven Hostel, which is about a 15 minute drive outside of the city center. Make the trek downtown because although you might like the idea of exploring the smaller neighborhoods for perhaps a more authentic experience, you won’t find much. We went to a restaurant by our hostel and they didn’t like us too much because we we couldn’t speak Italian. So, I recommend heading downtown because although things are a bit more touristy there, we just had a better overall time there. We went to dinner at a restaurant called Tasso, which includes some interesting decor of naked ladies and donkeys in compromising positions. It makes for a unique experience, and to top it all off, the food is actually delicious! I got this calzone (not very Italian, I know), but it was stuffed with ricotta cheese and ham. YUM. And it only cost 9 Euro. Also, the House white wine was one of the best I’ve had so far while in Italy. Another recommendation would be a restaurant called Il Leone Rosso “The Red Lion.” We didn’t go there, but multiple said if you’re looking for a real Italian meal, then this is your place. Unfortunately, we didn’t get to enjoy the nightlife of Sorrento due to the torrential rain we received each night during our stay. 2. Watch Out for Scamming Cab Drivers: You’ll hear this really anywhere you go in Italy, that you should be aware of how much your cab drive should cost before getting in one because they can really rip you off. But going into Sorrento, I had no idea how much things should cost. So, our tour guides told us right when you get in the car, tell the cab driver that you agree on 5 euro per person. That way they don’t even turn on the meter and don’t even have the chance to con you. We told this to our cab driver, and he knew exactly what we wanted, so it must happen a lot. 1. Eat Caprese: Whether it be on a panino (I recommend this! ), in a salad, or just by itself. It is so fresh no matter what restaurant or bar you get it from. Caprese originated from Capri, so it only makes sense to eat it while you’re here! 2. Buy a Pair of Carlos’ Sandals: While roaming the shops, you will run across homemade sandals made by a man named Carlos. And I’m really not kidding when I say these are the cutest sandals I have ever seen in my life. They are a little pricier (ranging from 50 euro to 70 euro), but that’s because he makes each of them by himself in his store. He will even make customized sandals for you. You pick the design, color, everything. I really regret not buying a pair. 3. Don’t Order a Cappuccino from the Bars by the Marina: Just don’t. We decided to be cute and sit at a table by the water, order ourselves cappuccinos, and do as the Italians do aka people watch. It was all fun, until we got that check. A cappuccino, the smallest cappuccino I have ever received, almost the size of an espresso shot, was FOUR EURO. My friend’s glass of white wine only cost two euro more at six euros. We should have known since we were sitting in a very touristy area, but if you value your money like I do, don’t do it. Just sit on the ledge by the water for free. 4. Get a Granita (with Vodka): A granita is basically an orange slushy, and you have the option of having vodka in it. I chose not to get any because it was only 10 in the morning, but it costs 5 euro with or without it. And they put in the smallest shot, so it doesn’t take like alcohol at all. Anyways, I drank this in like two seconds because it was so yummy. 5. Take the Chairlift up the Mountain: For 11 euro, a 12 minute chairlift ride will take you up Monte Solaro and drop you off in Anacapri. I didn’t do this because I am terrified of heights, but my friends did, and they said it offered the most beautiful views of the whole island. If you are feeling adventurous and looking for awesome photo taking opportunities, all my friends say this is a MUST. 6. 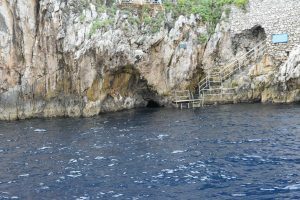 Beware the Blue Grotto: The Blue Grotto, a cave in Capri, was the one thing I was the most excited for. I’ve seen pictures of the radiant blue water that exists inside this dark cave, and I was instantly intrigued by its beauty. We pull up in our boat, and I jokingly point at this little cavity in the side of the island and say “Hey guys, we’re here.” Little did I know that we actually were there! I’ll attach a picture to give you guys more of a visual, but it was genuinely a funny situation. You go into a row boat and literally have to lay down, while the guy rowing pushes you inside. I was absolutely terrified. I was going to do it anyways despite my fear, but I really was nervous. Suddenly, by the grace of God, the waves picked up and it got really choppy, so they told us we couldn’t go in. I’m not trying to scare anyone into not doing it because you so should. The few people that were able to go in showed us pictures, and it was insanely beautiful. Just expect the unexpected when you finally see the entrance. You see what I mean? How? What? Nope! 1. Prepare Yourself for the Beauty: The entire time I kept thinking that this place cannot be real. I must be dreaming because nothing I have ever seen in life has been this beautiful. For one, the drive over is considered one of the most scenic routes in the world, which I completely 100% agree with. You can see all the colorful houses stacked on top of one another, you can see the bright blue water. The entire time my mouth was agape from awe. Then, you finally get to Positano, and I really wish I had the words to describe what I was looking at. Thankfully, pictures are worth a thousand words, am I right? Get ready to be Instagram famous because every picture you are going to take is easily worth 100 likes. 3. Rent a Beach Chair: For those of you who may get sea sick or don’t like the idea of being on a boat, for just 13 euro you can rent a beach chair, which might be preferable because the actual sandy beach part is very small. The beach is mostly rocks, and trust me, just stepping on them hurt enough. 4. Dine at Vini e Panini: A little store close to the beach, it sells, you guessed it, vini (wine) and panini. 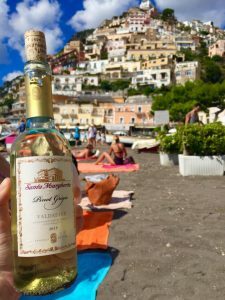 It’s not a sit down restaurant or anything, but you are able to take your small bottle of wine (seen in the pic below) and your panini back to the beach so you can enjoy the beautiful weather and the beautiful people. The guy who works there is so nice, we even started singing “Volare” together because who knows why. It’s authentic enough because the sandwiches are handmade in front of you, and you can choose what you put on them. Definitely worth the trip! 1. Pay for a Tour Guide: I believe the price was 20 euro, which is not bad, considering this place is huge! Also, there are no signs indicating what anything is, so you’ll basically be staring at rubble trying to decipher whether it’s an artifact or maybe just a random pile of stone. Our tour guide told us soooo much about the history of Pompei and how life was before the devastation, which really put things into perspective. I’ll be the first to say that I HATE guided tours, but I truly truly believe having a guide for this was beneficial. 2. Prepare to See ALOT of the Human Anatomy: I’m not sure how to phrase this in a way that isn’t crude, but I’ll try my best. 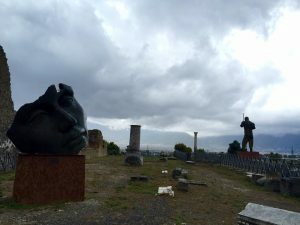 We get to Pompei, we are walking amongst the gift shops, and there was one common theme that was consistently occurring throughout our roaming. There were a lot of postcards, keychains, figurines, you name it, that highlighted the male anatomy. It was a tad disturbing, and I’m still trying to understand why there was such an emphasis on it. I’m thinking because in the actual Pompei exhibit, there is a brothel that remained very much intact that included paintings on the wall of very detailed images. Google it if you’re interested, but it’s hilarious because out of everything that survived Mount Vesuvius’ wrath, the brothel was probably the one place that remained the most unharmed. Anyways, prepare yourself for it. Shield your children’s eyes, but you really won’t be able to escape it. Just embrace it, and buy yourself or a friend a keychain. They’re hilarious. 3. The Big Statues in the Courtyard are NOT Important: When we went to Pompei, there was basically an exhibit in the exhibit happening. There were these big statues of heads and bodies laying out around the yard, and they were created by an Polish/Italian artist named Igor Mitoraj. Basically, they have nothing to do with the actual Pompei exhibit, and it made me kind of sad that people directed so much attention to these things and hardly any attention to the actual buildings in front of them. They were cool, yes. I did take a picture next to them, yes. But, don’t waste your time when there is so much other cool things to see. 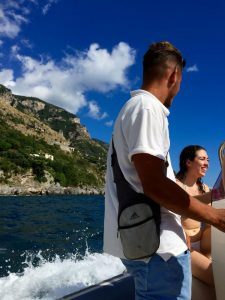 I recommend going to the Amalfi Coast during warmer months. If you are studying abroad in the fall like I am, do it in September because the weather was so beautiful, despite a few rain showers at night or early morning. It was probably one of the best things I have ever done in my life. If you wish to hear more tips or recommendations, feel free to contact me: cmajewski@luc.edu.